(Nanowerk News) When light pulses from an extremely powerful laser system are fired onto material samples, the electric field of the light rips the electrons off the atomic nuclei. For fractions of a second, a plasma is created. The electrons couple with the laser light in the process, thereby almost reaching the speed of light. When flying out of the material sample, they pull the atomic cores (ions) behind them. In order to experimentally investigate this complex acceleration process, researchers from the German research center Helmholtz-Zentrum Dresden-Rossendorf (HZDR) have developed a novel type of diagnostics for innovative laser-based particle accelerators. Their results are now published in the journal Physical Review X ("Observation of Ultrafast Solid-Density Plasma Dynamics Using Femtosecond X-Ray Pulses from a Free-Electron Laser"). 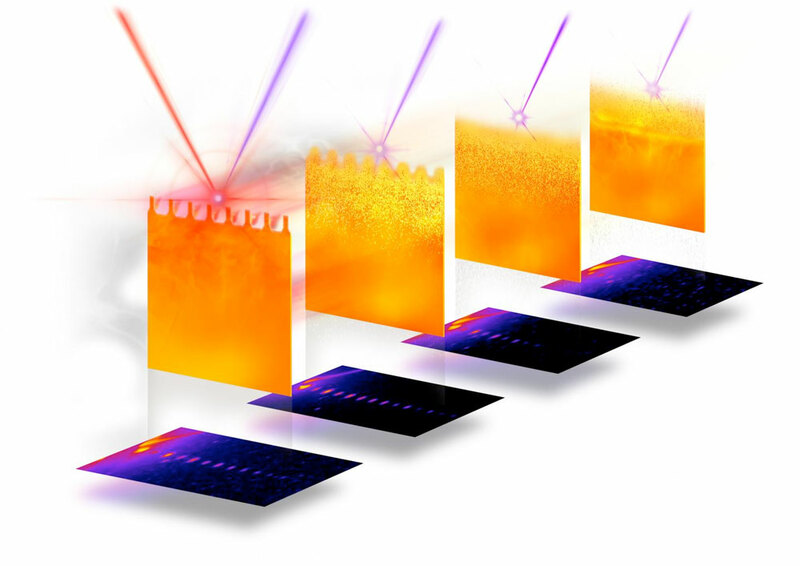 Thanks to its ultrashort pulses in the range of a few femtoseconds - a time during which a light beam crosses just a fraction of a human hair - the DRACO laser achieves a power of almost one petawatt. This corresponds to one hundred times the average electrical power generated worldwide. To achieve this feat, the scientists need two special lasers at the same time: The high-intensity laser at SLAC has a power of around 40 terawatts - that is, about 25 times weaker than DRACO. When striking the material sample (target), it ignites the plasma. The second laser is an X-ray laser, which is used to precisely record the individual processes: from the ionization of the particles in the target and the expansion of the plasma, to the plasma oscillations and instabilities that occur when the electrons are heated to several million degrees Celsius, up to the efficient acceleration of the electrons and ions. The fact that this detail predicted by the calculations could be discovered in the experiment, which after all lasts only ten femtoseconds, raises hopes - for instance, to be able to observe further spontaneous pattern formations (instabilities). These can be caused, for example, by the oscillation of the electrons in the electromagnetic field of the laser. The researchers are interested in identifying instabilities that disrupt the acceleration of the electrons and ions - with the aim of avoiding them by selecting suitable targets, for example. "However, we also know from our simulations that instabilities can even increase the efficiency of the acceleration process," explains the physicist. "In our simulations, we have identified the Raleigh-Taylor instability, among others." 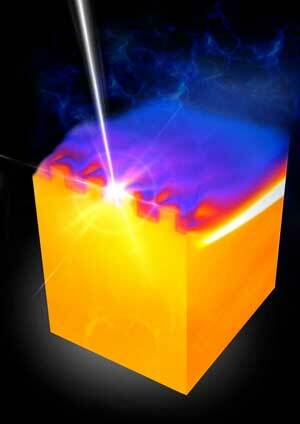 This causes the optical laser to transfer more energy into the plasma it generates. Such 'positive' instabilities could thus be an important adjusting screw to optimize the process of ion acceleration mediated by the electrons.